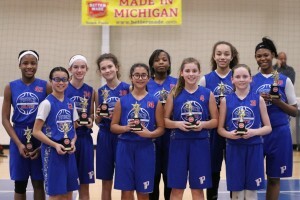 The 2019 Pistons Academy Overdrive Tournament concluded yesterday with both championship games being decided by just one point. Those thrilling games concluded a day which saw 11 teams playing in 19 games over a ten hour span. It was a fun and exciting experience as the players showcased their abilities and efforts at the Franklin Athletic Club in Southfield. 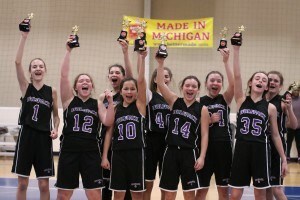 The 8th grade championship saw some amazing play by both teams as the North Oakland Wolfpack (Gurn) outlasted the speedy Windsor Vailants, 52-51 in overtime. It was a game that saw 41 fouls called and 48 free throws attempted. Wolfpack guard Ava Hernandez scored five of her 16 points to help lead her team to victory. She also hit a game-tying three with 1:26 left in regulation and then went 2-2 to tie the game again with just seconds left in the half. Maddie Ebbert added 12 for the Wolfpack who shot 10-19 from the line. Lilly Collins scored 22 for Windsor. 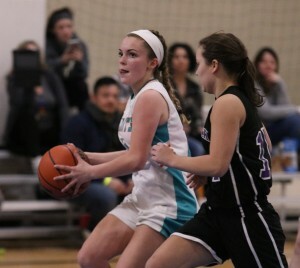 The Vailants were paced by the amazing play of Lilly Collins who scored a game high 22 points including an impressive 13-17 from the FT Line. Kiki Sran added 10 points including two big-time threes late in the game. Windsor shot 18-29 from the stripe. Windsor led as much as nine points in the first half before the Wolfpack closed the half on a 10-2 run to set the score 24-23 at the break. Click the brackets below to view playoff games.